LEDs are busily conquering most every niche in automotive lighting except headlamps; this demanding application represents the final frontier, and it is beginning to yield to SSL. 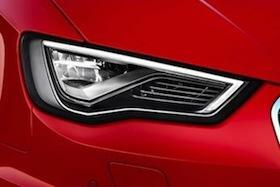 LED headlamp on the new Audi S3. We have touched on the use of LEDs in automotive applications, some of which are about lighting (this site's focus) and some of which are not. Turn signals and tail and brake lights fall into the "indicators" category; then there is the LED "bling" that is becoming ubiquitous on new cars, some of which we covered from Bangkok and from Seattle. But the one application that is unequivocally lighting-related is automotive headlamps, and we have only touched on that subject. Headlamps represent a challenging environment in which to implement LED-based solutions. There is a requirement for high brightness. Color must fall within the dictates of a few international standards. Unlike traditional halogen and xenon (HID) lamps, LEDs do not shed much if any heat in the forward direction with the beam, and so the heat at the junction must be dealt with via heat sinks or other means. The lack of forward infrared can be a drawback in cold climates, where other arrangements must be made to handle snow and ice buildup on the lens. LEDs' unique capabilities encourage the desire to do more with automotive headlamps than simply to replace existing technologies with identical forms based on LEDs. A European consortium led by Osram has been developing standards for adaptive driving beam (ADB) headlamps designed to react to external conditions and position and adjust the forward light for optimum driver visibility without adversely affecting other drivers. Such advanced headlamps are available on high-end models of Mercedes, Audi, and other brands in the EU, but they can't be deployed in the US until and unless federal regulations change to allow it. Currently a National Highway Traffic Safety Administration rule requires a manual control for switching between high and low beams. An IMS Research study from early 2008 found that Osram, Nichia, and Lumileds combined accounted for over 50 percent of the automotive lighting market, across all applications. That early data would not include hardly any headlamps. I have not seen later figures, but see no reason to believe this picture has changed in a basic way. Osram recently announced Headlamp Pro LEDs. As implemented in a US-made PAR56 replacement headlamp by Peterson, they produce 1,100 lumens for the low beam and 1,650 lumens for the high. A quick look at the Lumileds Altilon indicates it is in the same class. I wasn't able easily to locate Nichia's product details, but I assume their offerings are comparable. In Japan, penetration of LED headlamps is running well ahead of that in the US; Europe is somewhere in the middle. Koito is the market-leading headlamp maker in Japan (using Nichia LEDs), and they project a 30 percent share for LEDs overall by 2017, according to an Optics.org report. By contrast, in the US we will see LED headlamps used in between 12 and 21 percent of automobiles by 2020, says Strategy Analytics in a study we noted in June. The Optics.org article linked above reports that representatives of the Society of Automotive Engineers have met with the NHTSA to discuss adaptive driving beam systems. Toyota has filed a request with NHTSA to be allowed to sell cars with such headlights in the US. The agency will be seeking comment on the request. So we may see some movement on allowing ADB headlamps on US roads sooner than later. In that article, a Koito spokesman projected that LEDs will replace HID headlamps worldwide by the year 2020. "To replace halogen, we have to cut the costs, and that's very tough work," he added. My 10-year-old car has its way forward lit by Xenon lamps. I strongly hope that by the time I replace it I will be able to choose an adaptive LED-powered headlamp option.